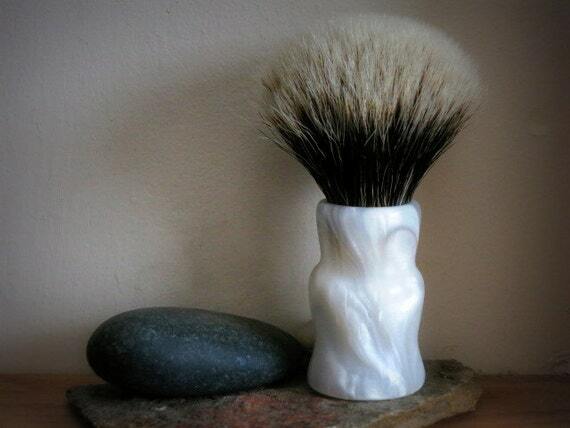 I have been restoring shaving brushes ever since I started wet shaving a few years ago. 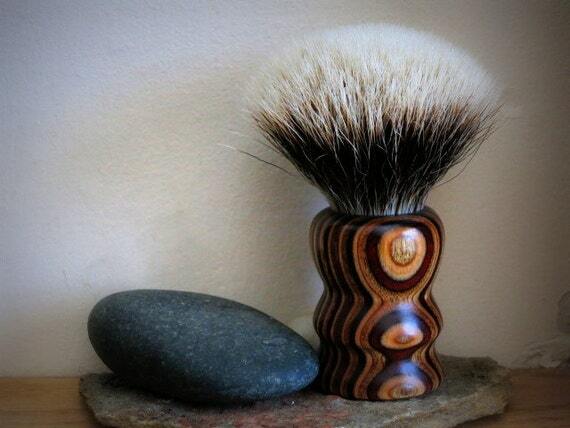 I have also been making handles in my shop out of exotic woods. 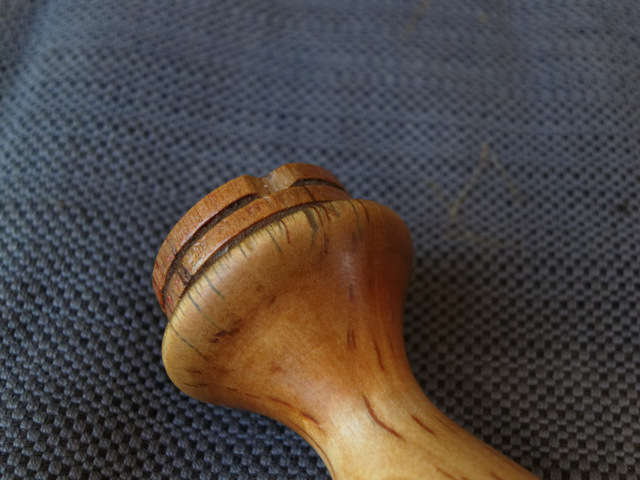 Since I do not have a lathe I create my shop-made handles without turning them. 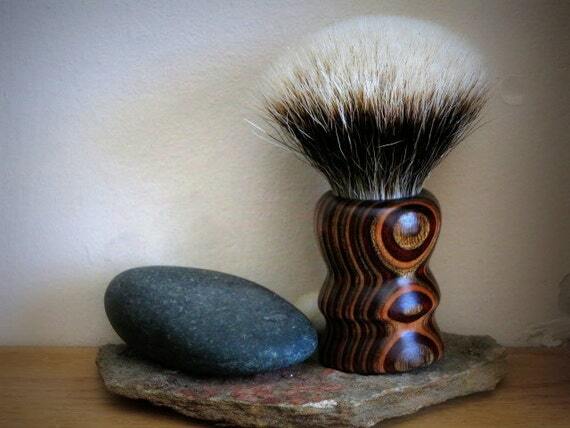 It's more challenging and the result has a different character from a lathe turned piece. I have been using my own brushes pretty much the whole time. 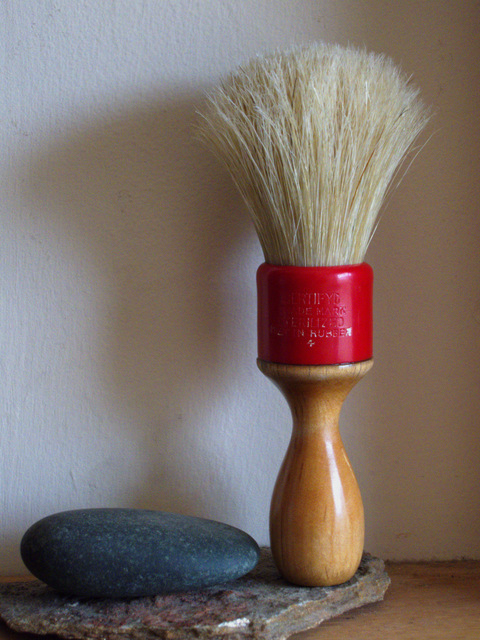 Most of my arsenal is TGN two band finest restores or my shop-made brushes. I am very happy with them. so much so I want to share them with the world. To that end I have created an Etsy store where I am starting to offer some of my work. I am currently working on building up inventory. 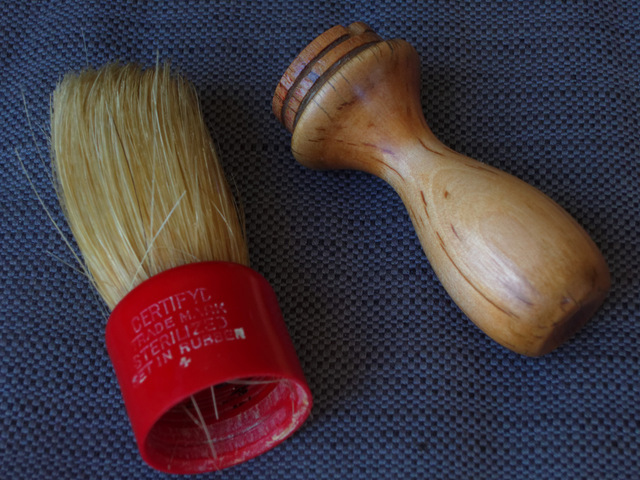 I have a good number of vintage brushes to restore as well as some interesting handle blank material I am experimenting with. I will put some pictures up in this thread with some links to the product page in the store. I would be glad to receive feedback on this. I am very new at this and need all the help I can get. 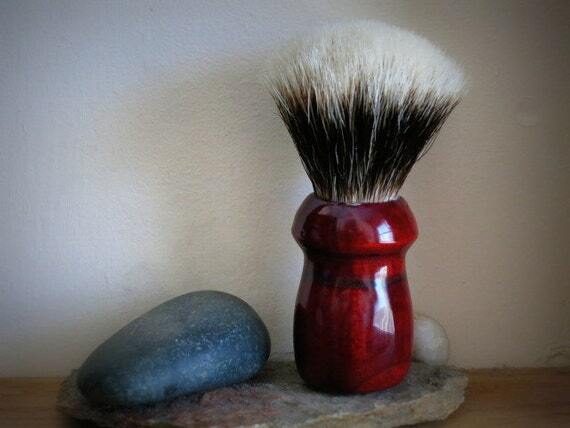 One of my latest shop-made brushes. This one came out really nicely. The knot is TGN two band finest bulb and is set at 25mm/52mm. 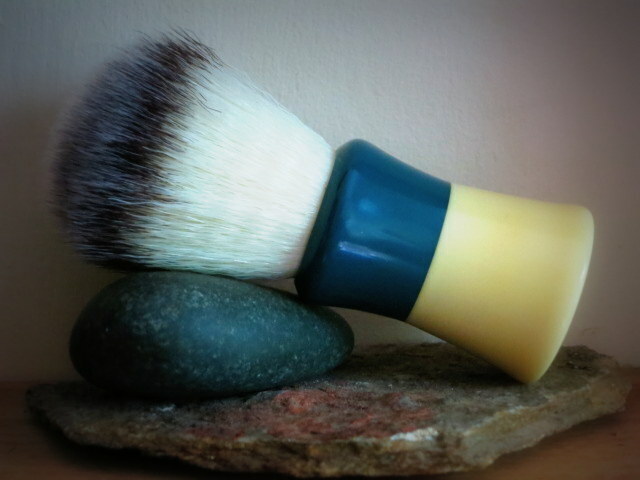 Test lather of this brush was amazing. 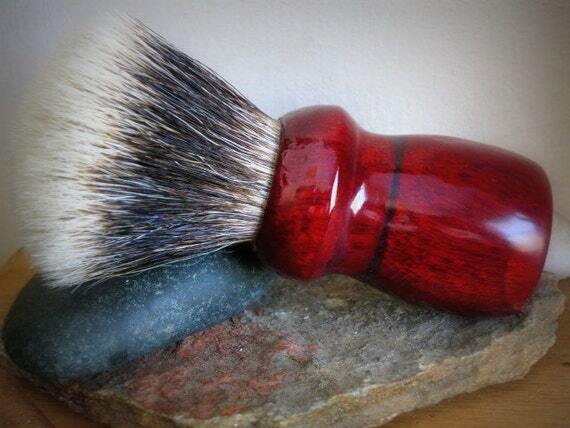 This one is one of my personal brushes I restored for myself. 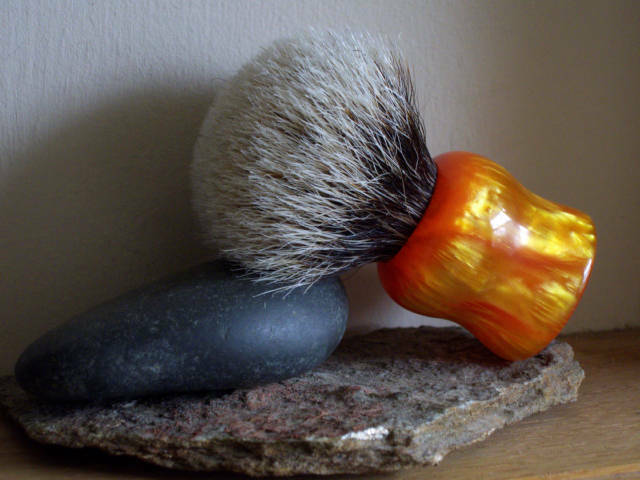 This is an older celluloid shell handle. Inside the bottom part is a gypsum-like substance for weight and structure. The top part used to be rubber (I think), but is now epoxy holding down a TGN two band finest bulb knot set at 21mm/43mm. 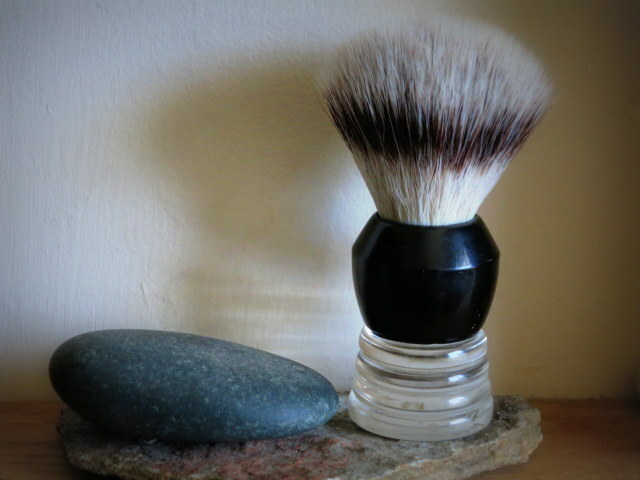 This is a fantastic small face lathering brush with a very ergonomically correct handle. This one is another one of my shop-made efforts. It is made of several piece of wood and there are some interesting patterns in the way the wood was laminated. I have finished this handle with two ton epoxy for total water seal. 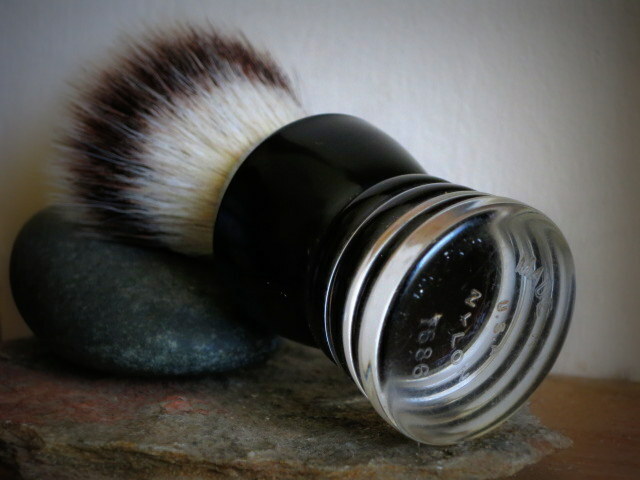 The almost glassy finish is very thick and feels great to the touch. This is a TGN two band finest fan set at 23mm/48mm. 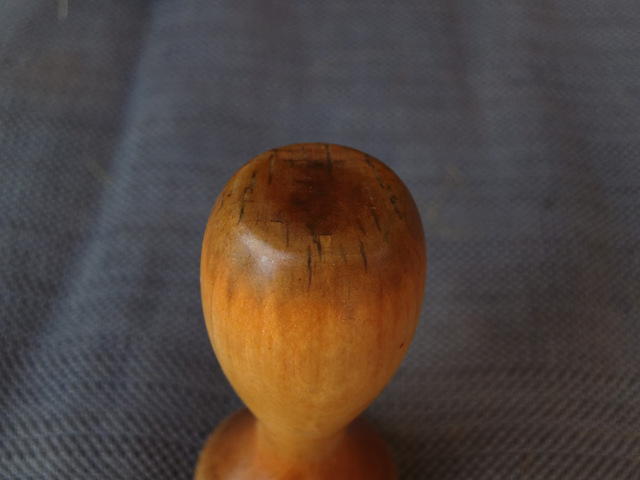 A really wonderful handle shape that I am definitely going to reuse. Feels really good in hand. 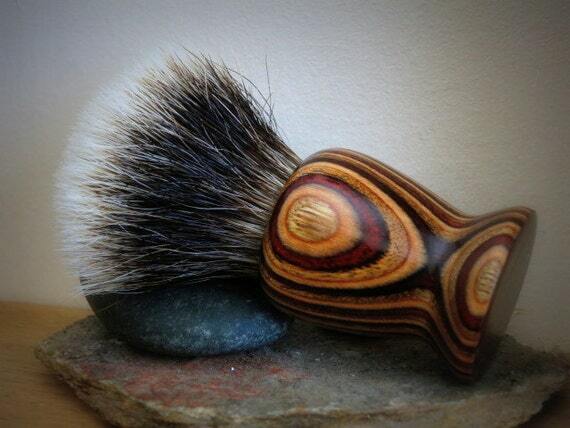 Here is another brush I listed in my store. This one is my first attempt at resin handles. I cleaned the knots out for post bloom photos. So far this is all. I am working on more restores and a few original pieces. Stay tuned. As you can see, I am a big fan of TGN two band badger. However, I can work with any type of knot. 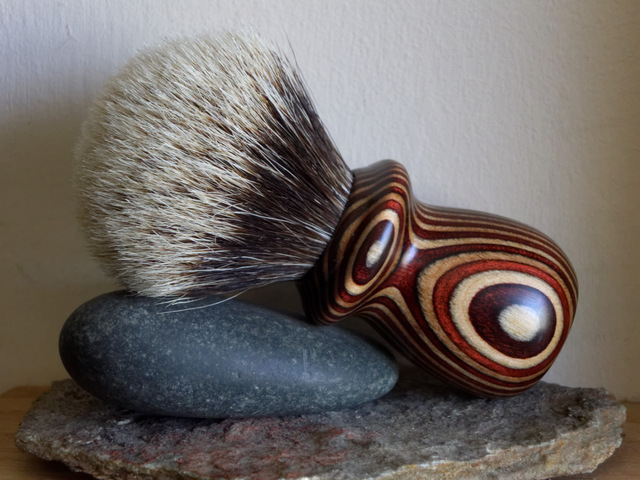 In fact I am also working on an Omega boar knot brush. 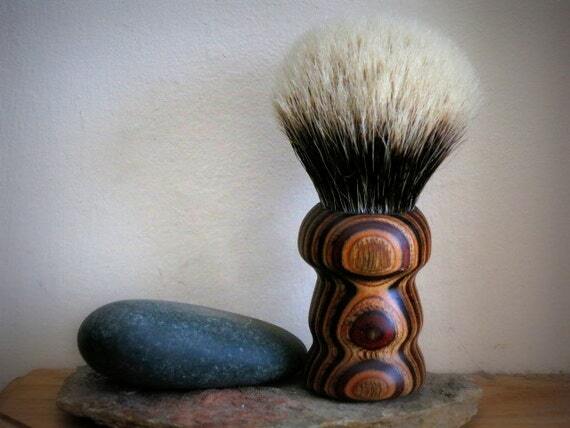 It will have the Pro-49 knot and some sort of special handle. 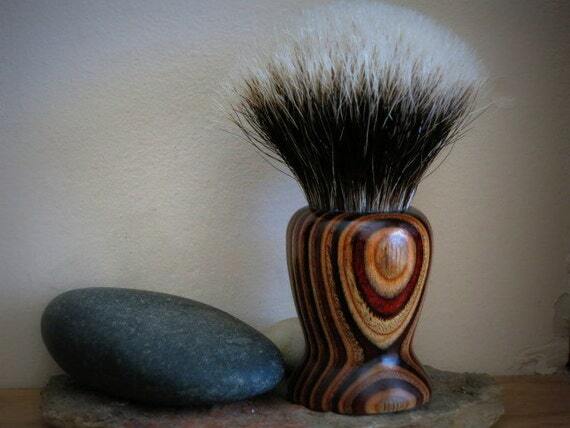 I can also take custom orders. Yes, terrific efforts. 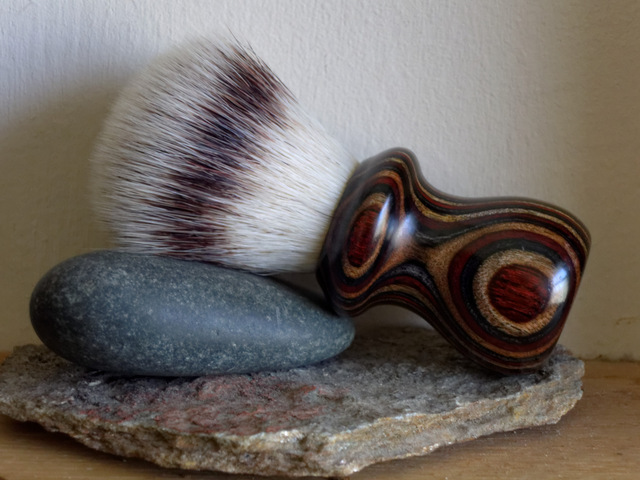 I commented in the SOTD about the resin-handle brush...unique and beautiful! Beautiful work, Vladimir! I really like the wooden handles. 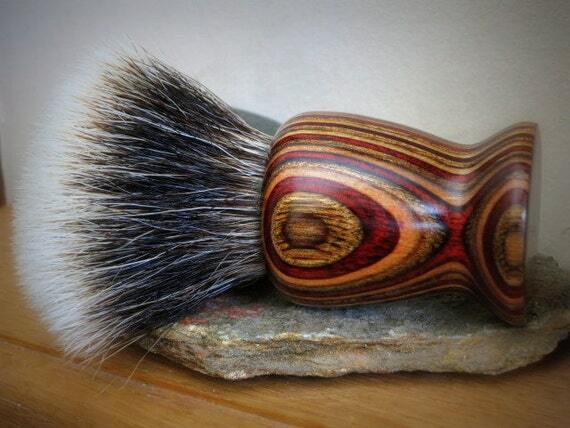 I wish I could watch you making one of these without a lathe. You're an artist. I am working on a number of restorations right now. 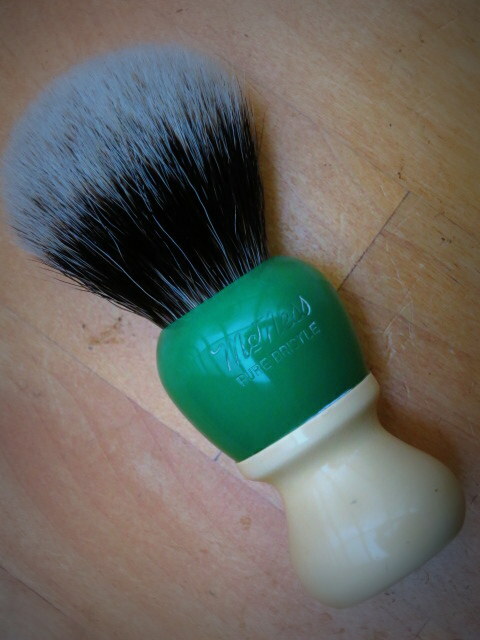 First one is this barber-style brush. Original shape of it was rough and I apologize for not taking pictures before any of the work began. 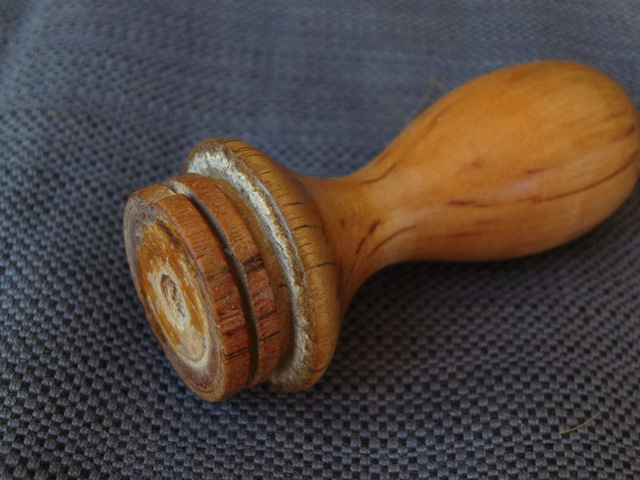 at this stage when the pictures were taken the handle and the plastic top have been separated, the original knot removed and the wooden handle stripped of the original coating, which was only partially present. Also, the handle has been sanded up to 220 grit and all the cracks filled with CA (crazy glue) and two coats of polyurethane applied. 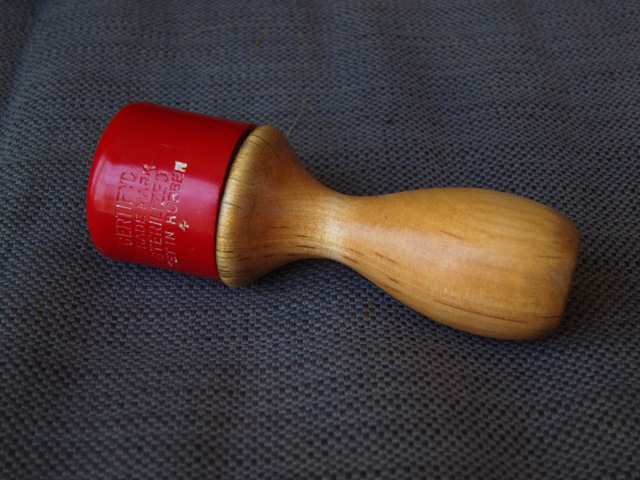 The red plastic piece has been also cleaned and hole slightly opened to accept the new Omega boar knot from TGN. 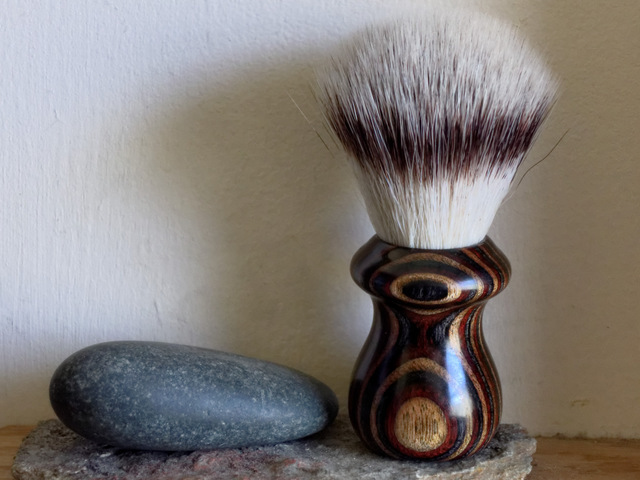 TGN sells this as a 27mm knot with a plastic bucket that you often see in a form of a ring around the knot on their brushes. Well, that plastic ring really didn't work with the red piece, so I cut it off the knot leaving just remnants of the plastic bucket in place. The knot is glued as usual with some sort of "knot glue" inside the plastic bucket, so there is no risk of degrading the integrity of the knot in removing the black plastic ring. As you can see in the pictures a dry fit is very promising. I really like the way this is going. 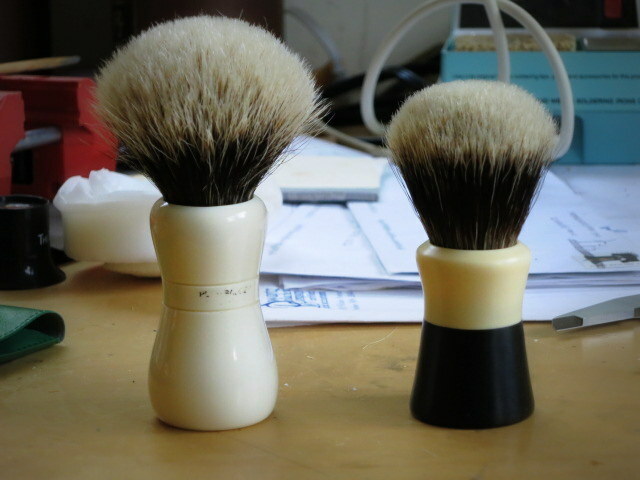 The original knot looks almost the same as the replacement, which is really nice, especially seeing as how the replacement is an Omega boar from their famous Pro 49 brush (as near as I can tell by reading specs). I made sure all the cracks are filled and wood is fuly stabilized with 3 coats of CA. CA not in cracks has been sanded and polyurethane applied on the wood. 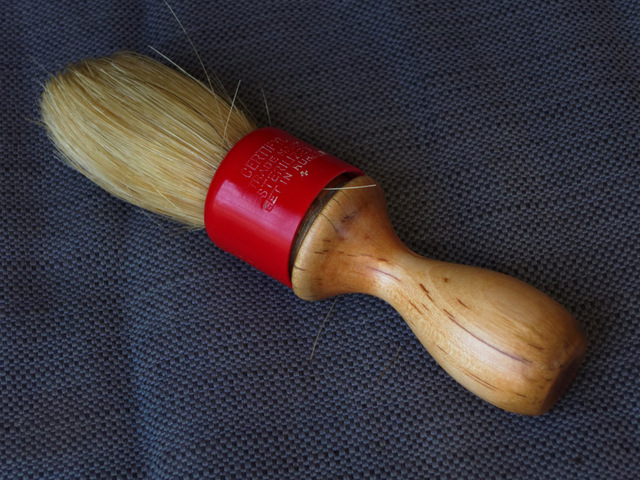 I plan to give it at least 5 coats of poly before I assemble the brush. The cracks are going to be visible, but sealed. 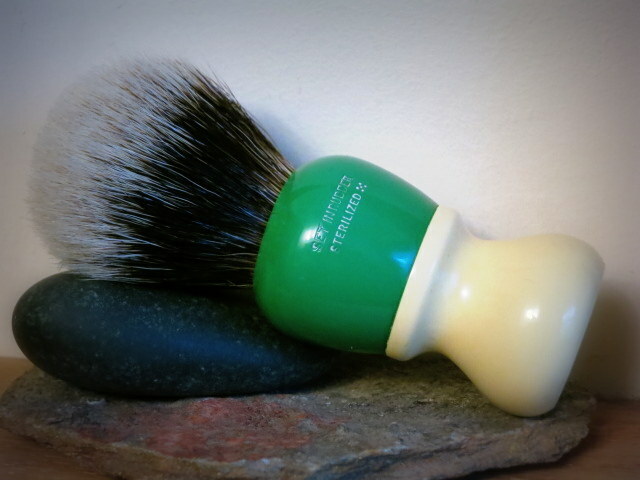 This will give that vintage flavor to the brush. I hope you like it. 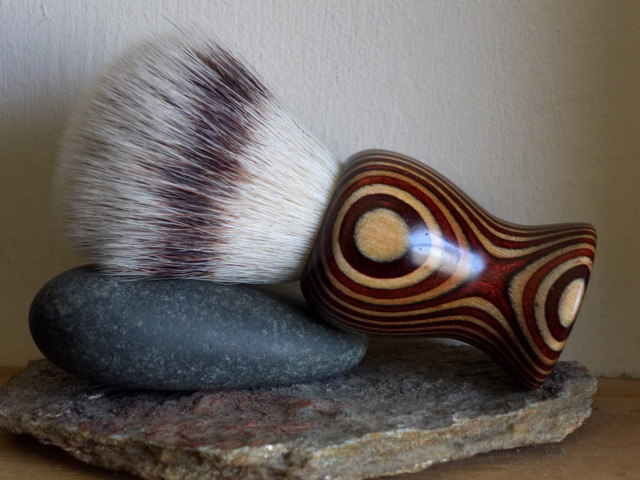 I finished the brush. I love it. I set the loft lower than the original knot was. I set it about 60mm - 61mm or so. 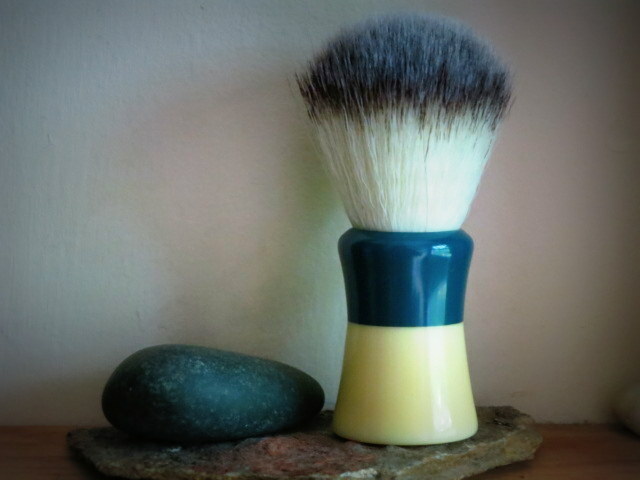 This brush is now available in my ETSY store. I hope you like it. I really LOVE it. I really like that handle, one of the most practical shapes ever. 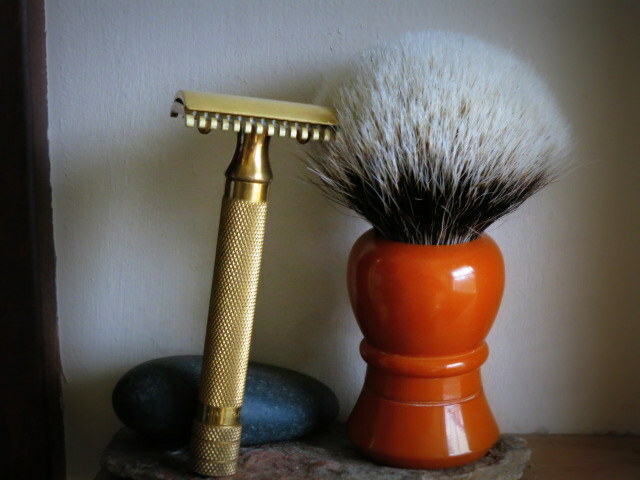 Squire wrote: I really like that handle, one of the most practical shapes ever. 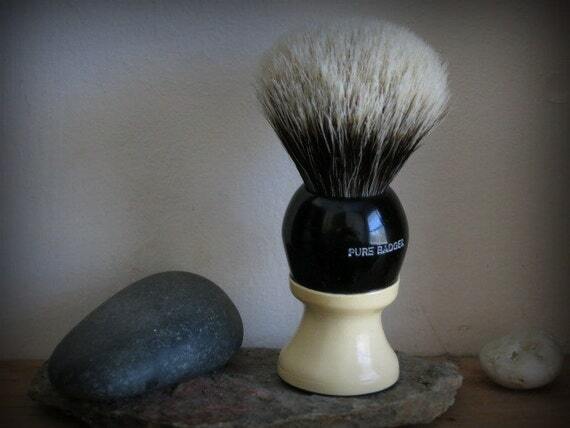 It is, especially if you are lathering another person, like a barber would. I used it today for a test run and it was excellent on my own face. Very sure grip. These large Omega knots (I assume it's a Pro 49 knot) are really good. 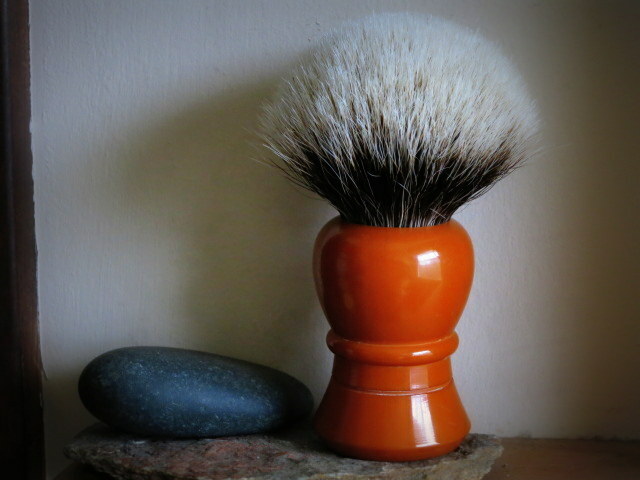 I never used a brush this big, but it feels just right, not huge or unmanageable. The tips are already split on it and came that way from TGN. 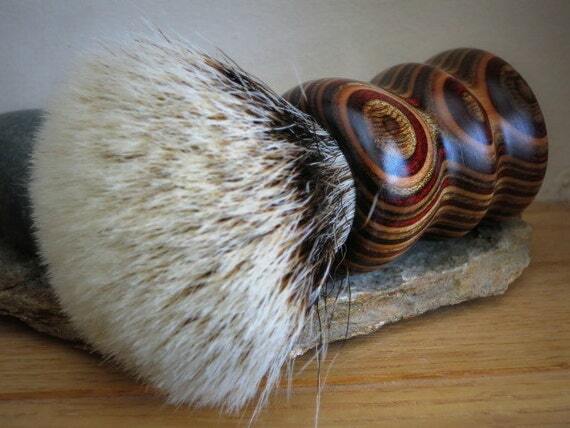 There is a lot of boar funk, so it's definitely a brand-new knot. 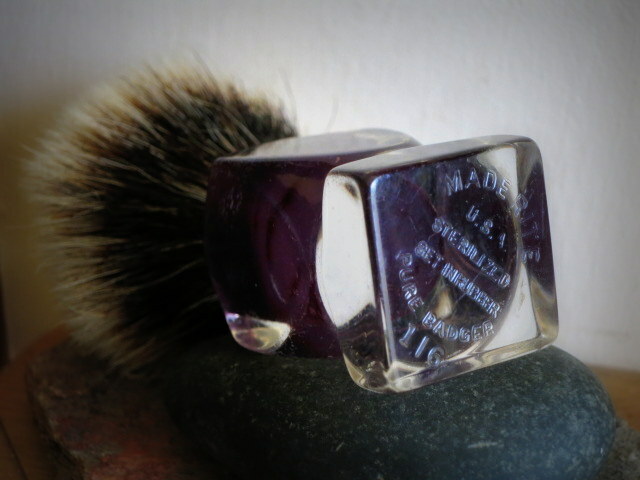 Omega probably treat the tips to break-in faster or the knot simply was stored in dry place for a long time. 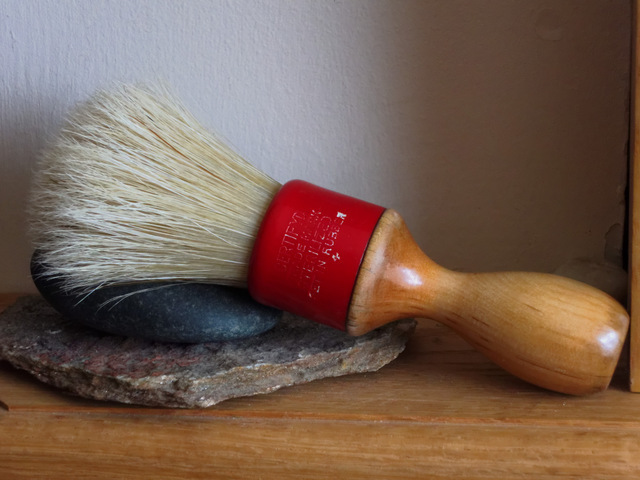 In any case, this brush is excellent. 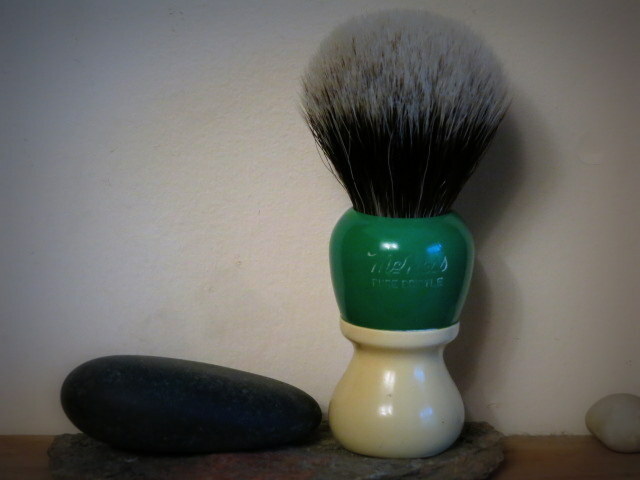 I got 3+ passes' worth of lather and had some left over to do a post-alum wash. All on 40 seconds load of Mike's soap. 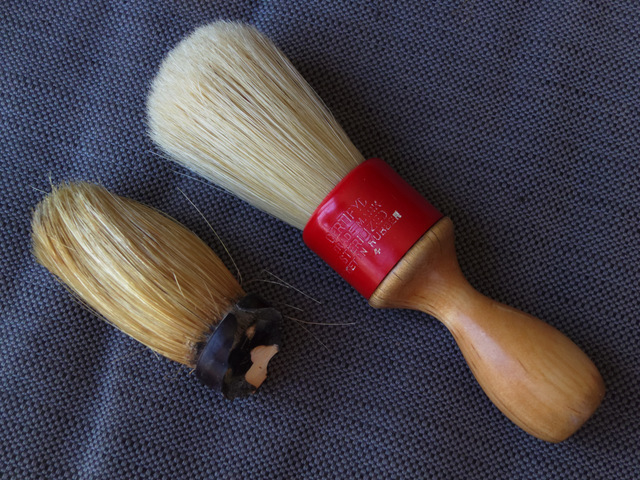 I restored two more brushes and put them in my Etsy Shop. 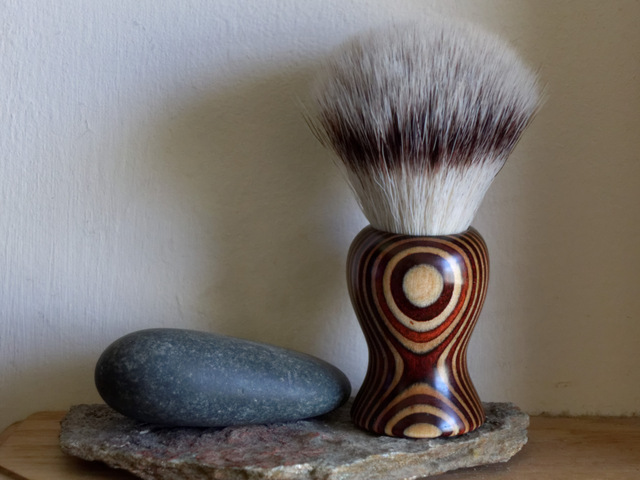 I made three more brushes from Dymondwood material. I really love this stuff. It is water-proof to begin with, but takes polyurethane very well, so I think it is as good as resin as far as water is concerned. 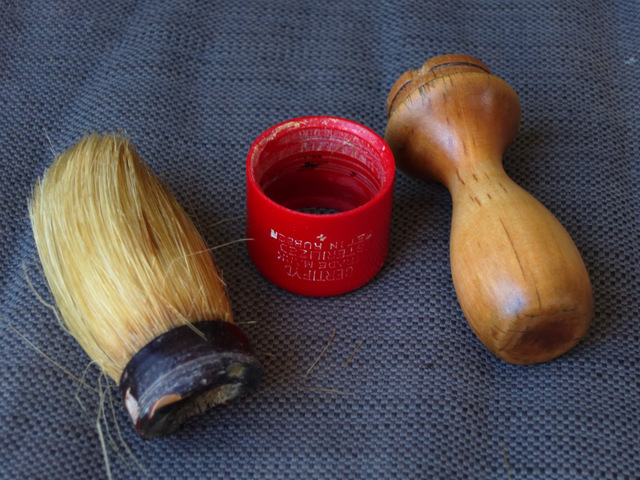 Perfect material for brush handles. And very beautiful. 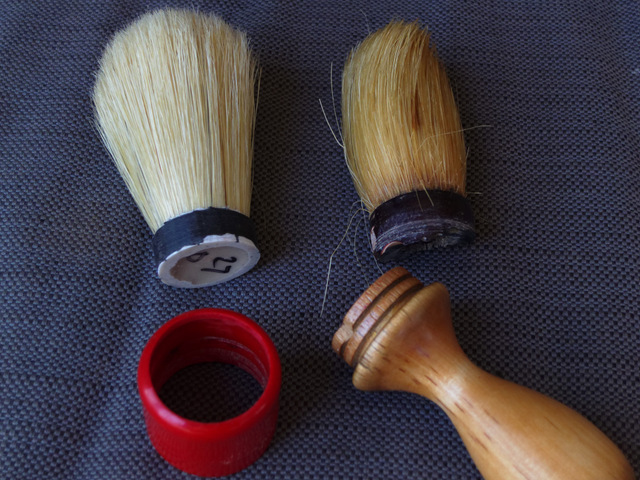 I have restored three brushes by commission. 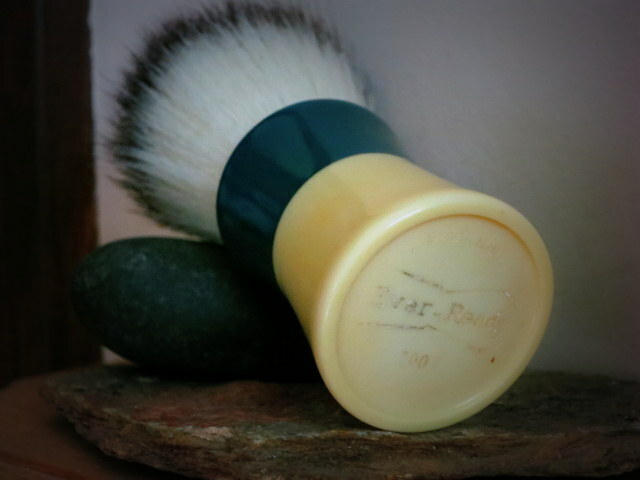 An unknown English resin handle with two band finest and Ever Ready 100T with two band finest. 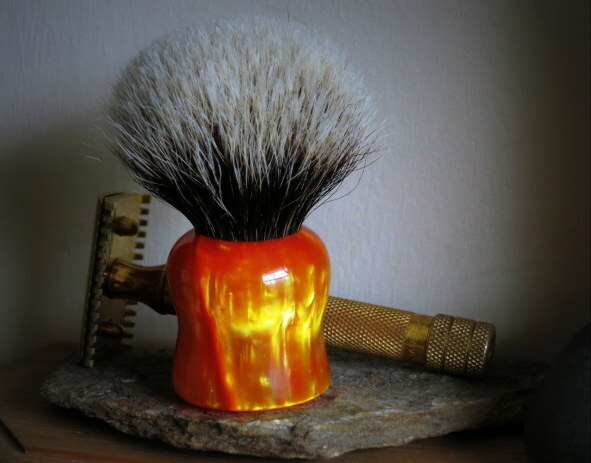 Here is a huge resin butterscotch handle of unknown origin, but boy, is it an amazing brush! 26mm two band finest. 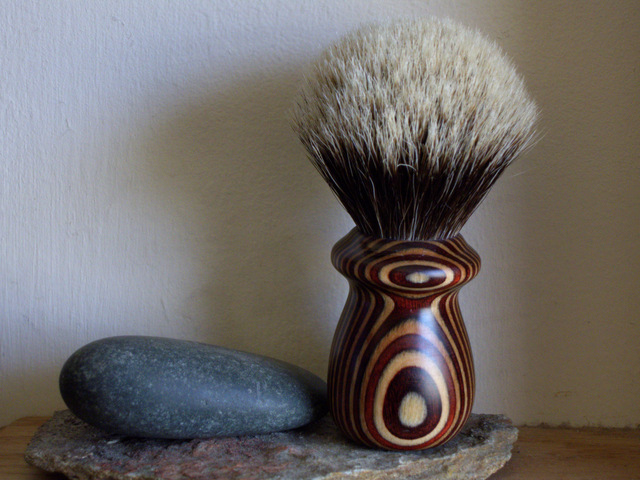 I made another brush for my inventory. 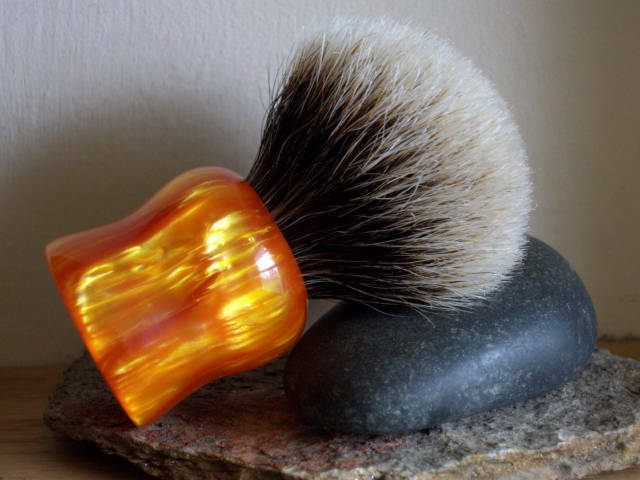 This one is from the butterscotch pearl resin blank. Amazingly beautiful material. Photos do not do the justice to the way the light plays with this stuff. 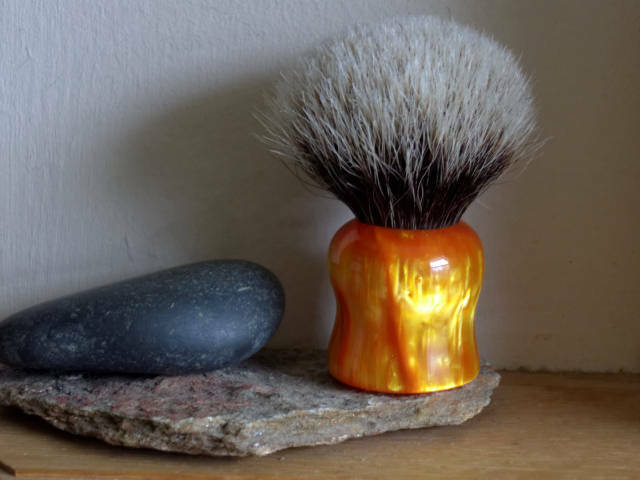 This is a small travel size brush. The knot came out to 21mm, loft 44mm. 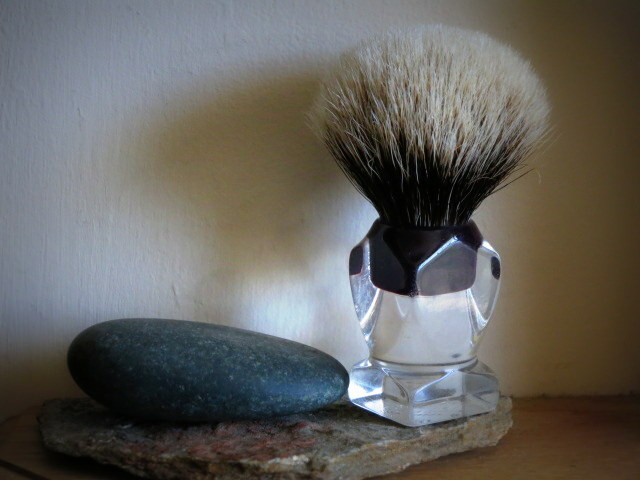 The setting is just about perfect after a test shave. 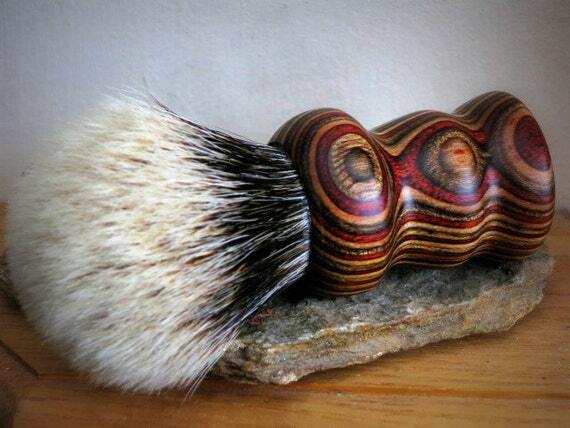 The lather release and flow through are perfect. 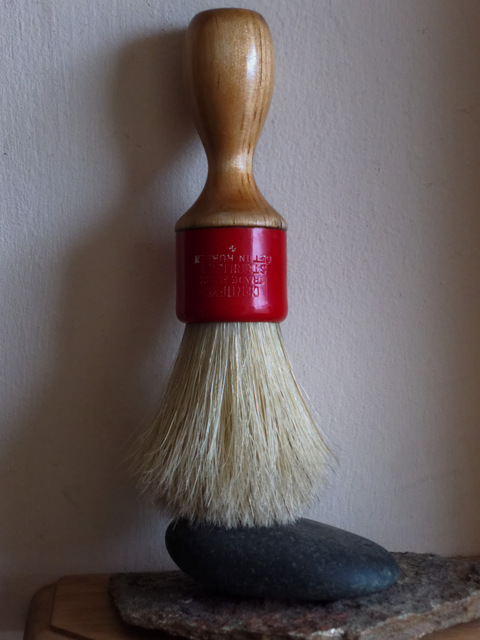 As much as I love my Wee Scot, I think this brush is way better and only ever so slightly larger. 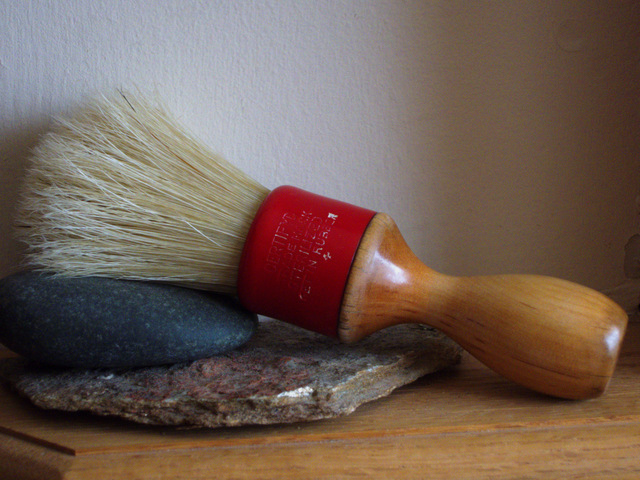 It's been a bit slow in my brush making shop, but I did get another vintage celluloid handle restored. 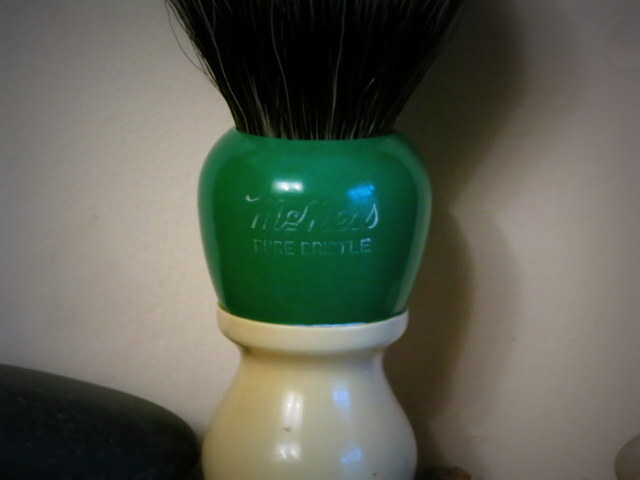 This one is McNess and is Kelly Green. It looks stunning with a black two band finest knot in it. This one is a beauty. It did have some radial cracks near the knot hole, which I had to fill from inside and out. Inside I used JB-Weld and on the outside I filled the cracks with CA and then sanded smooth to a high gloss. The cracks are visible, but are completely filled and are one with the rest of the surface of the brush. The rest of the handle was in excellent shape. 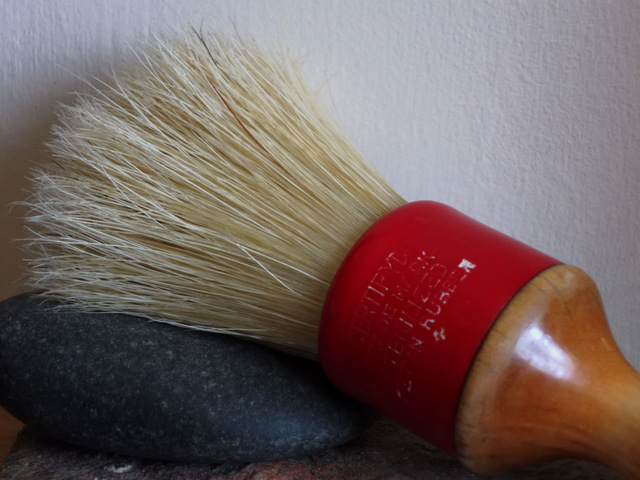 I really wanted to save this one because it is an old style celluloid handle of very good ergonomic design. These are hard to find in the wild. I love this handle. I think it's my favorite so far. Is this one of yours, or is it for a customer? brothers wrote: I love this handle. I think it's my favorite so far. Is this one of yours, or is it for a customer? Thank you, Gary. 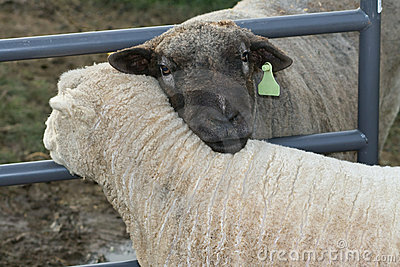 I really like this one too. It is extremely comfortable in use. This is not for a customer, but rather for my Etsy store stock. 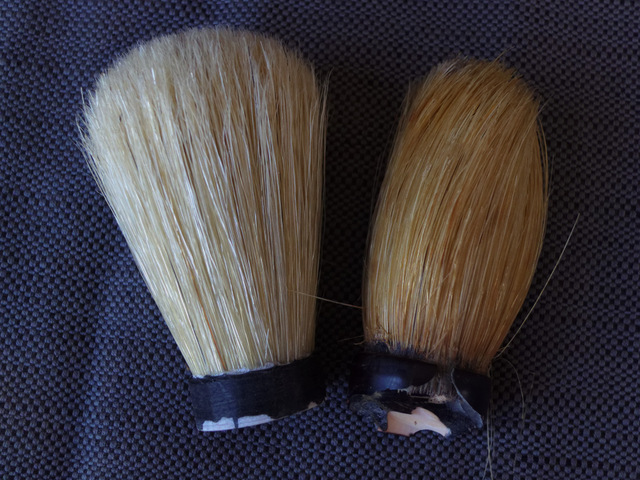 I got a few more brushes in the works for restoration and re-knotting. This is an Ever-Ready 200T. I gave it my signature E-R hourglass handle treatment. Eased the sharp corners at the top and bottom, smooth the seam between the two sections so it feels like a single piece of plastic, added weight into the hollow of the handle. 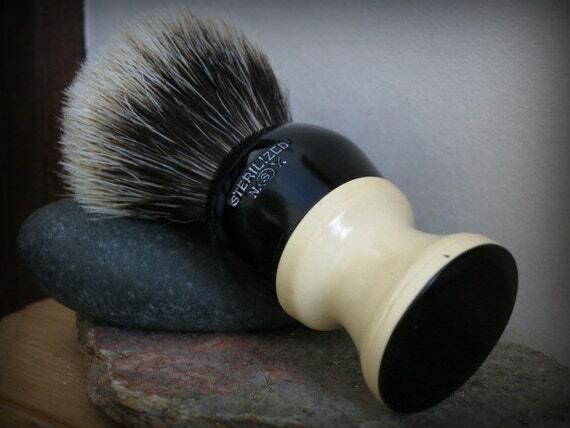 This one received a synthetic knot from Whipped Dog. It's about 26mm the way I set it.